When you have a night breakdown or flat tire, the number one thing you need to know for staying safe is making your vehicle more visible. You may be most worried about being robbed or attacked in the dark, but being hit by other drivers is a far greater risk. In nearly all cases once you’re off the road it’s best to call a towing service or other emergency service. You’ll soon have another person, an automotive expert, at the scene. There are several things you can do to keep breaking down from becoming a nightmare. Make sure your vehicle and insurance information is in the glove box. It’s also a good idea to choose in advance a towing service that covers your home and work areas. You should also keep an emergency kit in your vehicle with things such as a flashlight and flares or reflectors. 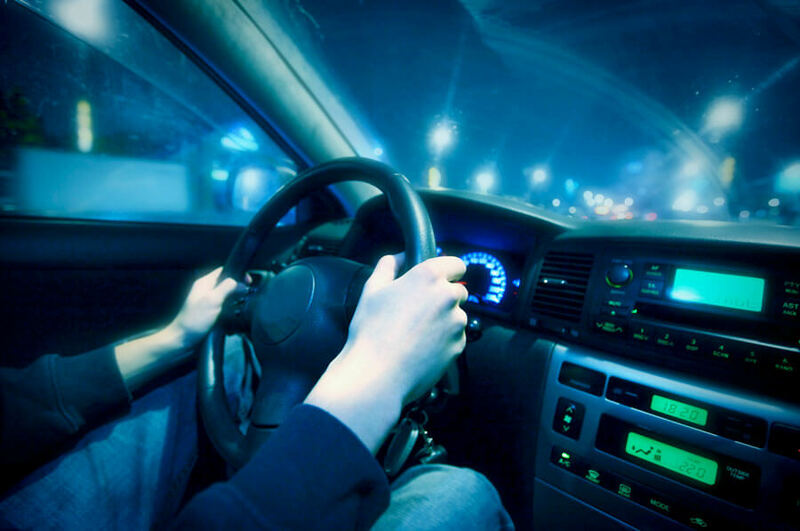 Warm clothing, a rain jacket and/or a blanket are especially important for a night breakdown. Keeping your vehicle well maintained helps avoid the problem in the first place. Finally, with a breakdown on the highway or busy road things happen fast, so get familiar with these emergency first steps. At the first sign of trouble turn on your hazard lights. This lets other drivers know you’ll be slowing down and getting off the road. Maneuver as far off the side of the road as possible. Well off the right shoulder or into a parking lot is best, but the left median will do if necessary. Don’t forget to put your vehicle in park and pull the parking brake. Turn the engine off for fire and carbon monoxide safety. If you’re near traffic on the left, exit through the passenger side. Raise the hood and set out flares or reflective triangles, if you can do so safely. Stay behind the safety barrier if you’re on a freeway. stay in your vehicle with your seat belt on and the parking brake off. If there’s been an injury, call 911 immediately. You can take care of quick-fixes such as changing a flat tire, yourself but only if you’re well away from traffic and in an open visible area. At night time in an isolated area don’t accept help from a stranger and don’t try to flag down someone for help. Instead call a tow truck company for a tow or roadside emergency service. Choose only towing services that are insured and TDLR (Texas Department of Licensing and Regulation) licensed, even if that means a longer wait. To speed things up a bit, use your car or phone GPS to find your location before calling. It’s very important to give the best location information possible. Also, let the towing company know of any special conditions, such as special vehicle features or anyone with a medical condition. Keep calm and be patient. Nighttime, remote locations, or bad weather means it’s likely to take longer for the tow truck to reach you. To stay safe while waiting for a tow, stay inside your vehicle with the doors and the windows only slightly opened. Never stand near your vehicle — that’s the worst place to be if there’s a collision. Before getting out of your vehicle there are a couple of things to check for your personal safety and to avoid a possible rip-off. First, they should arrive in a well-marked wrecker or service vehicle from the same company that you called. Second, ask to see their TXDPS (Texas Department of Public Safety) issued ID. Make sure the photo matches and that the license hasn’t expired. It may feel uncomfortable, but if necessary say you’ll wait for another company. If at any time you feel threatened honk your horn, flash your headlights, and call 911.